As we enter into a new year, you may see people start looking for another job or considering switching careers to something they have always wanted to do. When going through the job hunt, one of the most important things you should have is an updated and well written resume. For a person looking to get into the career of accounting, there are several different types of resumes they can utilize. Perhaps they used to be a CPA for a company or they were a bookkeeper for a small or family business. 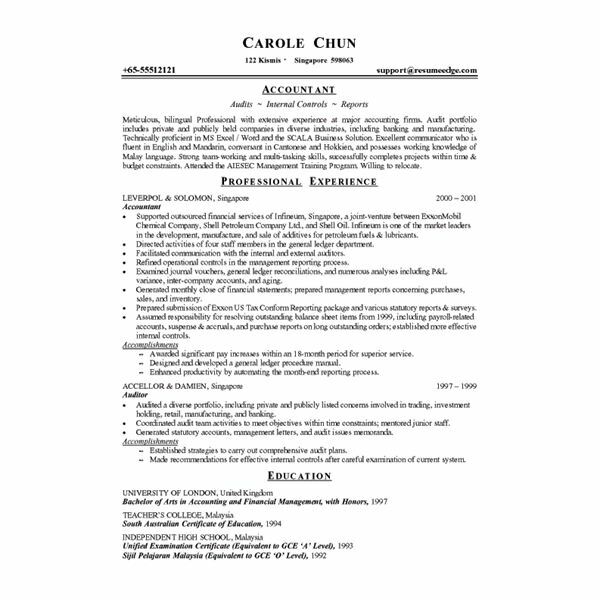 Here, view some accounting resume samples that will help you sort out what to include on yours. As with many careers, accounting has several different subsections that a person can enter. Some people do light to heavy bookkeeping; others are former or current certified public accountants. With such a large sect of different avenues, it may be difficult to decide what you should include on a resume. Resumes show potential employers what skills you have and what in your background would benefit the company. It is this reason that having a resume that shows exactly what you're good at and what skills you have in your arsenal is important; it is also the reason that your resume caters to the skill sets that you possess and those that a potential employer is looking for. In this article, I'll briefly go over some things that someone in a certain position would want to include on a resume. 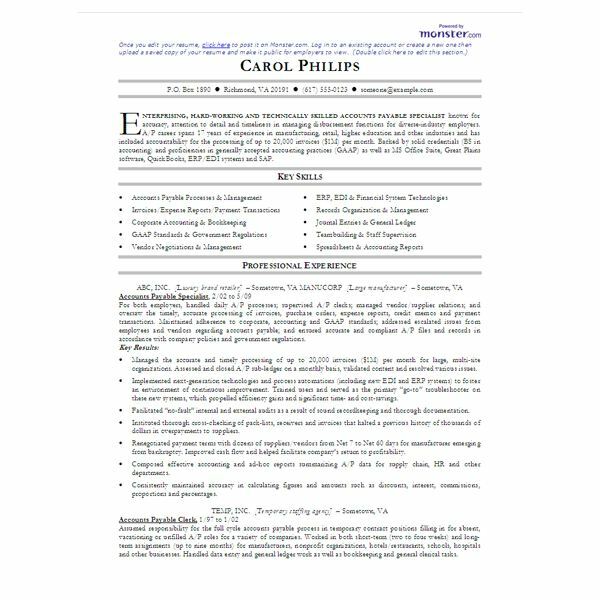 A very general resume usually includes an individual's name, his or her address, phone number, and email address as part of the header; the second section may have an objective (usually dependent on the individual and potential employer) that states what the individual is looking for in terms of work and/or a career. The third section usually holds work experience, followed by any degrees that a person holds, such as a bachelor's or Master's. In the case of someone who is an entry-level employee, schooling may come before work experience. Those in accounting will want to highlight tasks, skills, or experience in software, applications, or programs that demonstrate their skill sets. For example, someone who is doing a bookkeeping or accounts resume will want to highlight his use of financial software like QuickBooks, Quicken, or PeachTree; CPAs will want to highlight any points in which they did some type of auditing or used an auditing program. 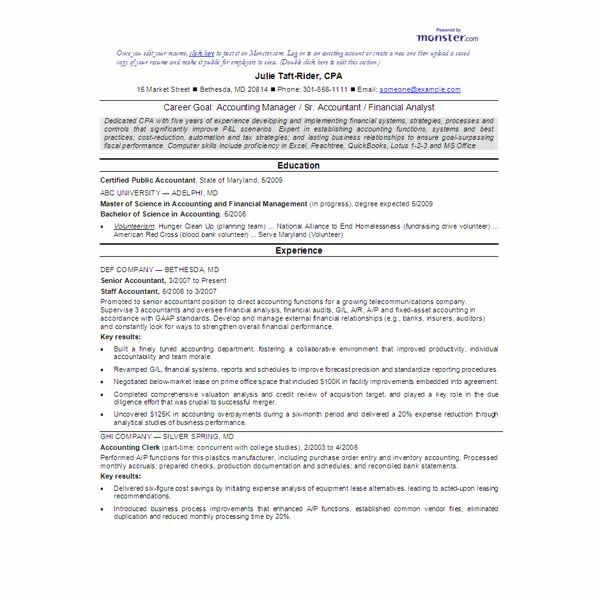 Below are some general examples of resumes for accountants and those with an accounting background. Again, these are general in nature, but they can give a decent representation of what employers will look for in terms of hiring an accountant for their company.